Cheap-Chic Decor: A Quilt Rack Keeps Blankets Ready! A Quilt Rack Keeps Blankets Ready! Keep warmth close by with this rustic and graceful quilt rack. The decorative scrolled metal provides useful storage for throws, quilts and comforters. 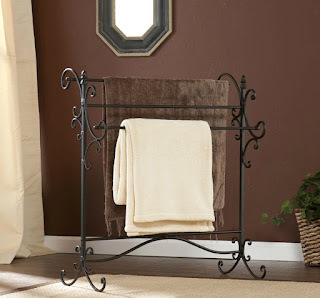 Perfect for a living room or bedroom, this beautiful blanket rack will be a wonderful accent to all your decor.